Here's Chance To Earn Rs 200 SD Cash. Just View 5 Product in Different Categories For Today and Tomorrow You can Earn Rs 200 As snapdeal SD Cash for Free Shopping. This Contest Start From Today and ends Tomorrow You Just Need to view 5 Different products on both days. MaalFreeKaa.in No. 1 Website in News Media About All Online e-Commerce News Update. You Grab Daily Awesome Freebie Product or Prize When you Play our Publish Online Giveaway and Free Sample Claim. Now We Leading Page in IPL 2018 Contest You Can Play IPL Contest and Get Free Official IPL Team Jerseys, T-Shirt IPL Match Tickets, Top 5 IPL Player Ranking And Much More. 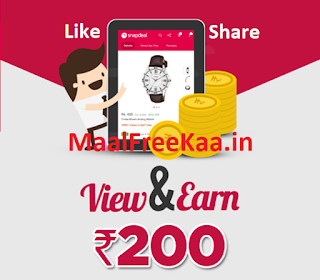 This Offer Only For App User Just View And Earn Assured Rs 200 From Snapdeal So download app now. 5. Promo Code You get will be Valid for 2 Weeks Only.